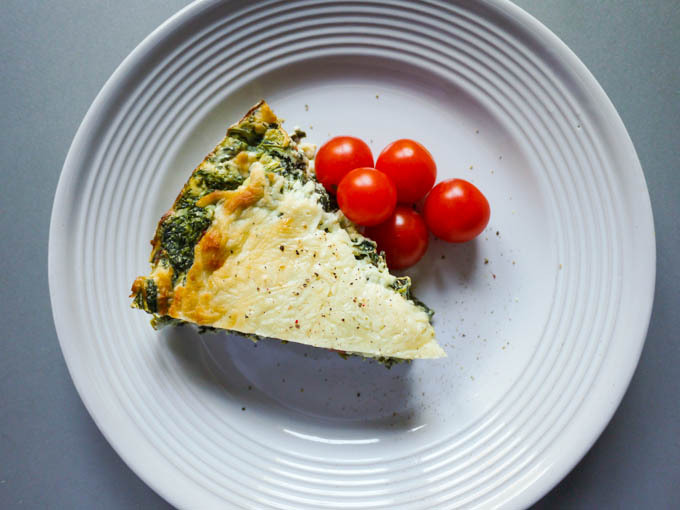 Preheat your oven to 350 degrees and grease a pie plate. 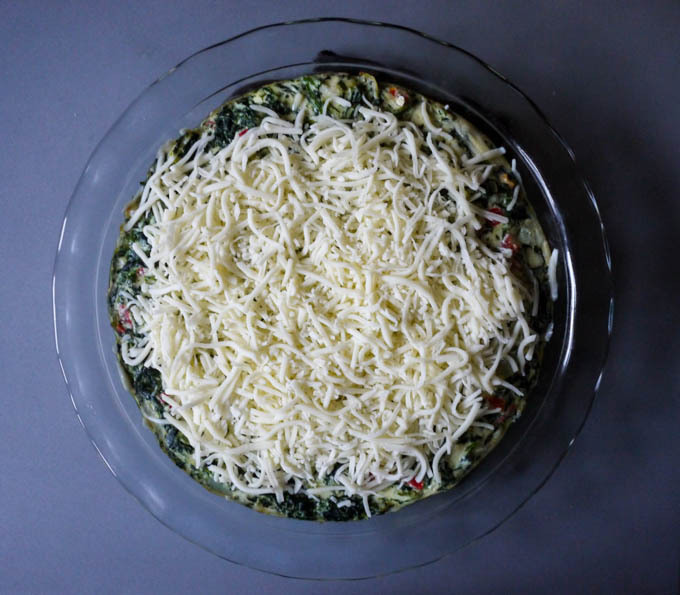 In a large skillet, add frozen spinach, onion, butter, nutmeg, and salt and pepper. Cover and sauté on medium high heat for approximately 10 minutes, stirring frequently. 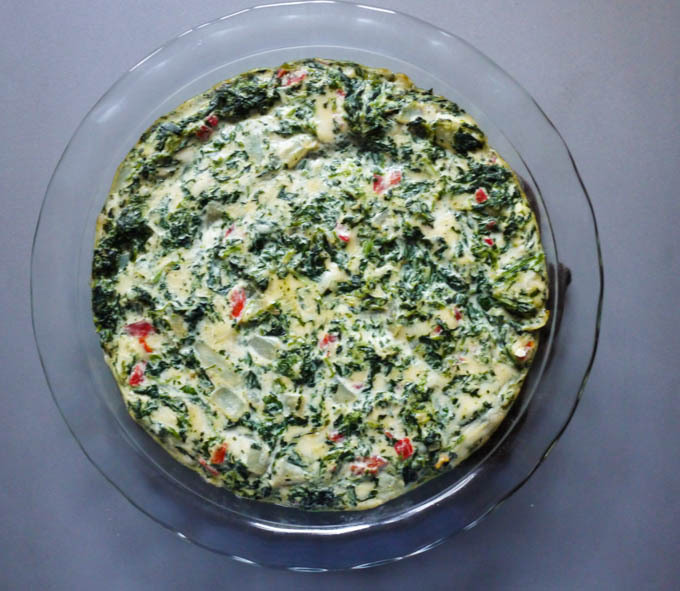 The spinach should be warmed through and the onion should be opaque. 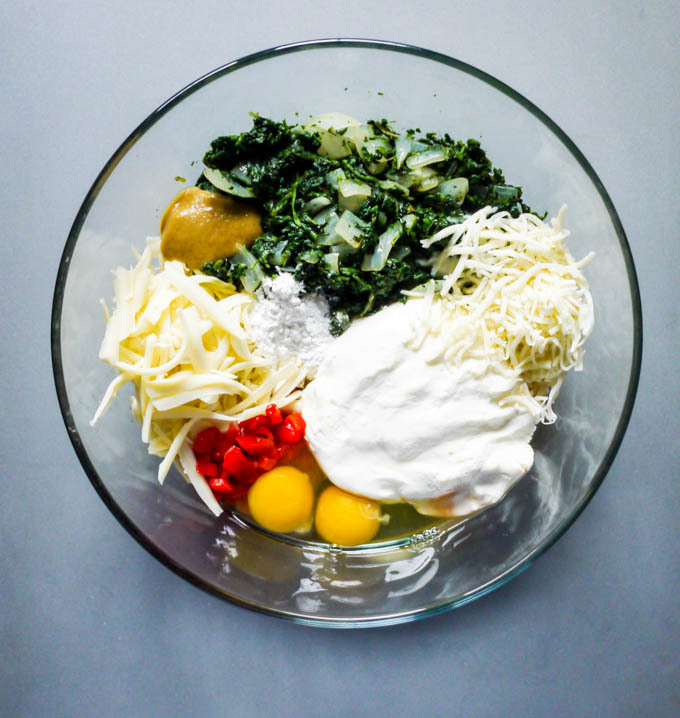 In a large bowl, add spinach mixture, ricotta cheese, eggs, cornstarch, pimentos, 1 cup of shredded mozzarella cheese, monterey jack cheese, and mustard. Stir well to combine and pour into a pie plate. 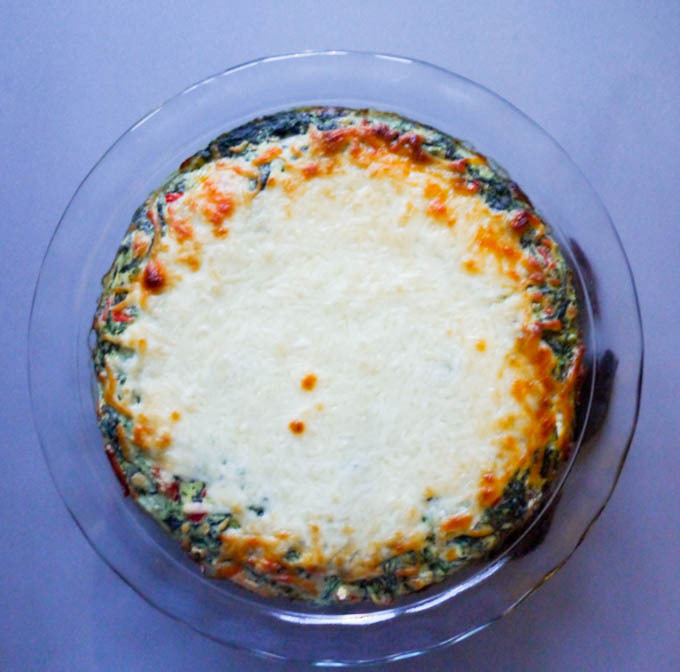 Bake for 20 minutes and then top with the remaining cup of mozzarella cheese. Bake for another 20 minutes, until the top is golden brown. Let rest for at least 20 minutes before slicing. I like to serve it for brunch at room temperature with a tasteful sprinkle of fresh pepper and a few cherry tomatoes on the side (and a gallon of champagne… lay off me… champagne is the new black). 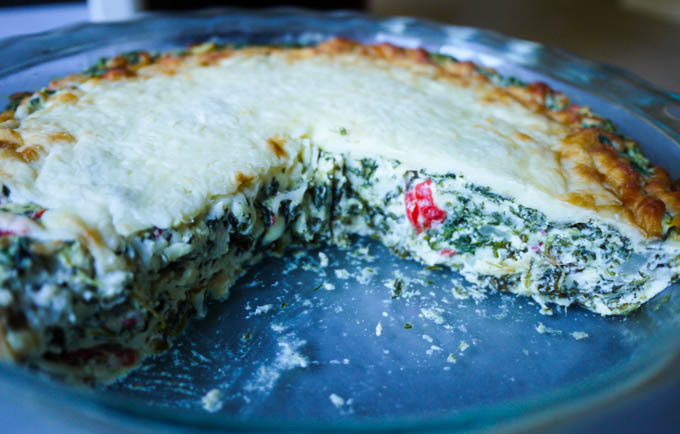 Ricotta pie filled with buttery sautéed spinach, onions, pimento and cheeses. 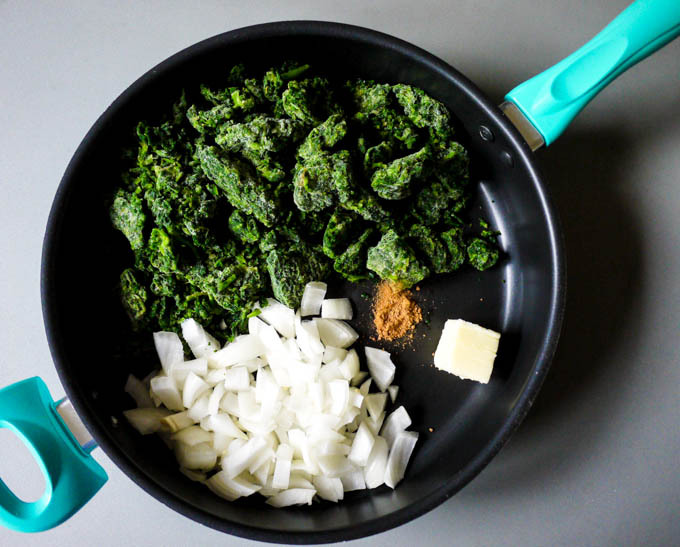 In a large skillet, add frozen spinach, onion, butter, and salt and pepper. Wow this looks good. Just what I felt like. Will have to make this in the coming days! I’ve never even heard of this, yet I’m suddenly craving it. Looks outstanding! Hi Tekesha, do you happen to know the fiber count per serving? This looks amazing but I need to be able to calculate net carbs 🙂 thanks! Thanks for replying! I’ve seen that script online but have never been able to make it work >:( I’m stuck with the ol’ columns-next-to-one-another-and-subtracting lol. 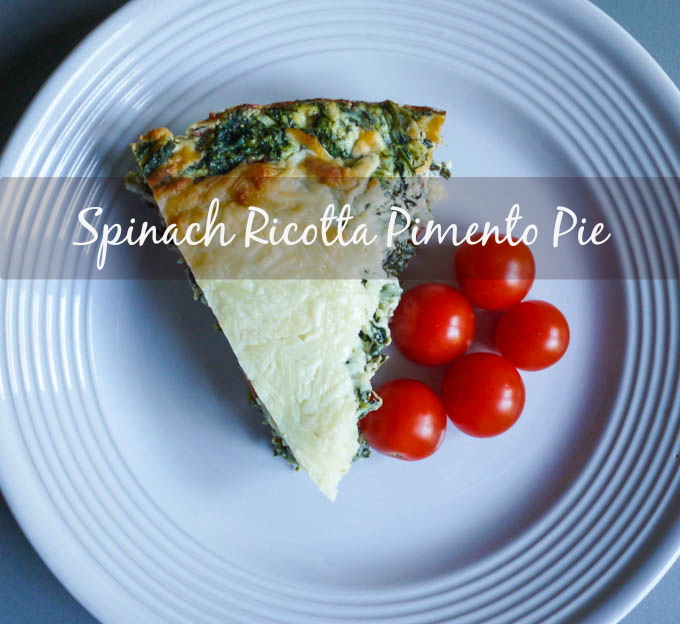 Thanks again, pinned this and will definitely try it!